Abraham Lincoln – fondly known as Honest Abe – was not as honest as history would have us believe. Throughout his life, he secretly fought and killed vampires for the benefit of the American people, while trying to run the nation and hold his family together. Timur Bekmambetov’s latest film takes history and adds a twist; what is Lincoln was a vampire hunter as well? Based on the book by Seth Grahame-Smith, the idea is similar to Pride and Prejudice and Zombies, but while the vampires have been crowbarred into Lincoln’s story, the movie does seem to play fast and loose with history. Benjamin Walker plays the titular president, and he does an incredible job of it. The movie could be incredibly silly and over the top – and at times it is – but it is Walker’s strong performance at the centre of the film that drags it back from the edge of unintentional comedy. Playing one of the US’s most beloved Presidents is no easy task, and it certainly is not easy to play the man as vampire hunter, but Walker manages to balance playfulness and seriousness to allow the audience to believe that Honest Abe was also a man who eliminated the undead. Dominic Cooper plays the vampire hunter who recruits and trains Lincoln. Cooper’s performance is neither outstanding nor terrible, and he does seem to have fun with the more campy aspects of the film. Rufus Sewell plays the villain with flair and just the right amount of menace but sadly Mary Elizabeth Winstead is not given enough to do for her character or performance to be memorable. Director Timur Bekmambetov returns to his place behind the camera after producing the awful The Darkest Hour, and he ramps up the fun and campiness for Abraham Lincoln; Vampire Hunter. The set pieces are completely over the top and silly and the fact that one character throws a horse at another should be enough of an indication of the schlock on screen. That said, it is entertaining schlock, but if horse throwing does not appeal to you, it is probably best to steer clear. While the set pieces are strong, the slow motion does begin to grate after a while, and the jumps between time periods – mostly motivated by Dominic Cooper turning up and sending Abe on another mission – are where the film loses its footing. Another area where the film falters is the 3D. Yes, the film is designed with 3D in mind, but the use of the technology darkens it to such a degree that, at times, it is hard to see what is actually happening on screen; with 3D glasses off, the film looks brighter and prettier but sadly, blurrier. Whether this was a problem with the cinema or the film is unclear, but the 3D adds little to the film as it stands, so maybe 2D is the way to go for this one. Vampire fans may not be amused by the choices Seth Graheme-Smith made in vampire mythology; the film seems to have borrowed liberally from the Blade movies, Interview with the Vampire (including filming at Oak Alley Plantation – Louis’s family home) and the bible. Vampires can only be killed by silver, there is not a stake in sight, vampires cannot kill one another, sunscreen allows them to walk around in the day and the process for turning a human appears to have more to do with will than anything physical. Thankfully, the vampires do not sparkle in the daylight; that would have just been too much. Abraham Lincoln: Vampire Hunter has fun and schlocky set pieces, but the film is let down by an unsure script and pointless 3D. Although the film is not a comedy, it does not take itself too seriously and Walker gives an outstanding performance as Lincoln. 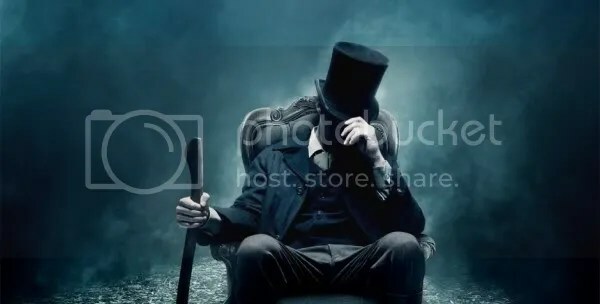 Leave your knowledge of vampire lore and history at the door, Abraham Lincoln: Vampire Hunter is ridiculous, plays fast and loose with history and vampire lore and while it is pretty terrible, it is actually rather fun. It looks like a really cool movie with all of the graphics, however i just don’t think vampires match up that well with abe lincoln. You would be better off combining ghostbustes with the patriot. Nice try though.